Damages to the teeth structure need to be remedied as soon as possible to ensure that they do not have a chance to progress into something more complicated and harder to treat; teeth damages or decay should also be fixed in the soonest possible time because they cause the whole smile to become unattractive, especially of the affected tooth is located in an area that is visible when the patient is smiling, or when the mouth is opened. White fillings by a Kent dentist provide effective solutions to cavities, and other damages to the teeth which may be caused by tooth decay or other factors. White dental fillings are also more aesthetically pleasing compared to silver amalgam fillings, which can be very obvious to others when the patient opens his or her mouth. As a result, white fillings are becoming the choice of more patients in providing solutions for their damaged or decayed teeth concerns. White fillings resemble the natural colour of hue of teeth, so they are not visible or obvious when the patient opens his or her mouth; it is possible to have white fillings without anybody else noticing about the teeth restorations. The damaged or decayed part can be fixed with white fillings that match the appearance of the other, existing natural teeth. Silver amalgam fillings, on the other hand, are dark coloured and are very visible to other people; every time a person smiles or opens his or her mouth, the silver amalgam fillings can very easily be seen by others. White fillings provide effective restorations, while giving the patient an improved smile that looks very natural. The use of white fillings to restore damaged teeth will involve the removal of less teeth structure, as compared to restoring the teeth using silver amalgam fillings. The placement of white fillings will just necessitate a small space (after the decayed or damaged part has been removed by a dentist in Kent), unlike the placement of silver amalgam fillings – which require a significant portion of the tooth to be removed before the material can be placed. The use of white fillings protects the healthy parts of the tooth from being damaged or removed during the entire procedure. White fillings do not contain mercury, which is known to have adverse effects on the human body. On the other hand, dental fillings made of silver amalgam contain a significant level of mercury, and can be harmful to the entire human body in the long run. The significant amount of mercury contained in silver amalgam fillings makes people wary about opting for this material, which has the potential to wreak havoc in the entire human body in the future. A lot of people also do not want the thought of having the mercury as dental fillings on their mouths for a long period of time, since there is a big possibility that the mercury can leak into the bloodstream – and into other parts of the body. Amalgam dental fillings may need to be replaced by a Kent dentist after just a few years of use, to prevent the whole filling from weakening or breaking altogether. 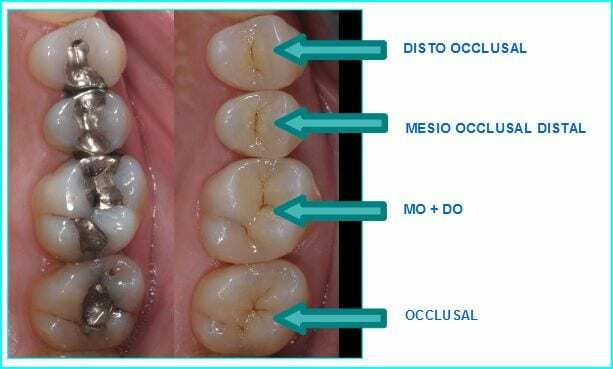 This poses problems for the patient, whose teeth will be put at risk due to this possibility; the inconvenience of having to go through the same procedure in just a few years with the replacement of silver amalgam fillings also make more and more patients prefer the use of white fillings. The need to replace amalgam fillings in just a few years will also result to more expenses in the long run for the patient, since he or she will have to go through the whole process once again. The use of white dental filling makes the restored tooth less sensitive to extreme temperatures (hot or cold), compared to the use of silver amalgam dental fillings. A patient who has teeth restored with white fillings will be less prone to the discomfort of drinking, chewing, or eating something that is extremely cold, or extremely hot. White dental fillings can restore the original strength of the affected tooth, since the filling material is bonded directly onto the tooth; the tooth restored with a white filling will benefit from the strengthening properties of this particular filling material. A tooth that has been restored with amalgam filling, on the other hand, is more prone to breakage; more complicated dental problems can even arise from the weakening of the affected tooth when amalgam filling is used as a tooth restoration.